Finding specific advice on inclusive processes for engaging a community in a planning or design process can be a daunting undertaking. The latest offering in the Tools for Community Planning Series is the product of nearly two decades of successful practice by internationally acclaimed community planning specialists. It is designed to support veterans and people with little or no experience to conduct a wide variety of community engagement events with absolute confidence. 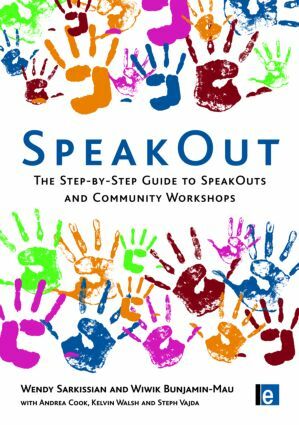 The book introduces the SpeakOut, an innovative, interactive drop-in engagement process. It provides hands-on, systematic guidance and detailed checklists for managing community engagement processes, as well as targeted advice on facilitation, recording and training. Five international case studies are included. This unique, illustrated manual is a 'must-have' tool for community, city and regional planners, activists, community organizations, students in planning and the other land professions and workshop facilitators and trainers everywhere. 'This is exactly the kind of practical, illustrated, how-to information based on real projects and real experience that practitioners need. The SpeakOut method pioneered and initially refined in Australia has a huge amount to offer everywhere in the world.' Nick Wates, author of The Community Planning Handbook and site editor of communityplanning.net 'A worthwhile read for practitioners of public participation … a manual, covering everything … readers need to pay attention to in order to ?get it right.?' Journal of Planning Education and Research 'The SpeakOut is a terrific new model for engaging a wider public than the usual suspects.' Ann Forsyth, Professor of City and Regional Planning, Cornell University, USA 'It's time to deepen the public conversation! SpeakOut gives us an intimate look at how we can do that.' Dr. Patricia A. Wilson, Professor of Planning and Civic Engagement, University of Texas, USA 'The SpeakOut method is fresh, simple, inclusive, and speaking from our experiences it is successful! If you are looking for an exciting way to connect with people, have fun and build consensus, this book is definitely for you!' Katherine Dugmore, Waterfront Project Manager, City of Thunder Bay, Canada 'A comprehensive book on SpeakOuts … [The] many case examples are complemented with thorough checklists and principles for designing and leading successful community engagement processes.' David Sibbet, President and Founder, The Grove Consultants International, San Francisco 'This is a wonderful tool for training the next generation of planners and designers in good participatory process…There are few books that integrate the tools and process, then walk you through how to 'make sense of the outcomes,' as this one does…No voice will be left out if you follow this book.' Sheri Blake, Professor, Department of City Planning, University of Manitoba, and Director, Detroit Collaborative Design Center amplifying the diminished voice. 'This book offers civic innovators one more valuable tool.' John Gastil, Professor, Department of Communication, University of Washington, author of Political Communication & Deliberation and co-editor of The Deliberative Democracy Handbook 'A welcome and refreshing addition to the tools around to help planning practitioners to hear a more diverse range of community views.' Julian Hill, Victorian Department of Planning and Community Development, Melbourne 'Sarkissian et al. understand how people learn - with short, interesting stories which inform clear guidelines for future practice…SpeakOut is a practical guide…that ensures people's voices are captured in a way that is respectful, creative and productive.' Janette Hartz-Karp, Curtin University Sustainability Policy (CUSP) Institute, Curtin University, Western Australia 'This book provides practical instructions on organizing SpeakOuts, a productive way of engaging diverse communities, with helpful tips and informative case studies. A particular delight of the book is that case studies are provided by local organizers themselves, thus demonstrating reflective learning and the ease of becoming a leader in a SpeakOut.' Dr Carolyn Whitzman, Senior Lecturer, Urban Planning, University of Melbourne 'With this book Wendy and her co-authors share with us their deep knowledge and life-long experience with innovative spirits and sparkling commitment!' Henrik Nolmark, Managing Director of Urban Laboratory, Gothenburg, Sweden 'SpeakOut is a worthwhile read for pracitioners of public participation' R.D Lasker, Journal of Planning Education and Research, 2010. Wendy Sarkissian PhD, a speaker, planning practitioner, academic and workshop facilitator, has co-authored many award-winning books on planning and community engagement. Wiwik Bunjamin-Mau MURP, educated as a planner, has several years of community planning experience in rural and urban settings in Hawai'i. Andrea Cook is an experienced strategic urban/community planner. Kelvin Walsh is an urban designer recognised for his innovative work. Steph Vajda is a community cultural development practitioner. There is increasing global demand for more local involvement in the planning of the environment. This is the only way that communities will get the surroundings they want and make the transition towards a sustainable future. This series of short, accessibly priced, practical books have been written by the world’s leading planning professionals to provide tools to support community planning wherever it occurs. Each book is a stand-alone, but together they create a compelling resource for planning professionals, community groups, activists, planning students and anyone looking to facilitate engagement in a community context.